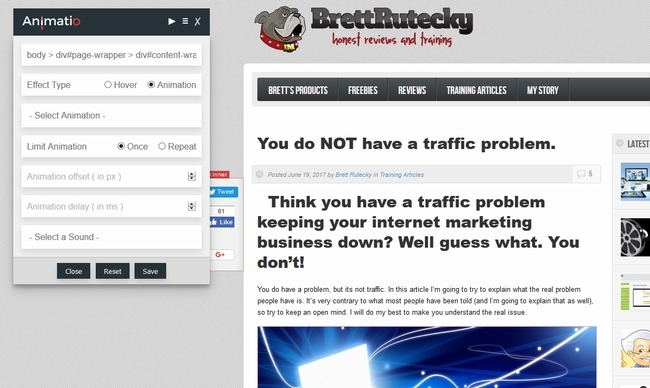 Today I’m taking a look at a new WordPress plugin called Animatio. I want to share a very sobering statistic with you before I get into my full Animatio review that explains one of the reasons I became interested in testing this new WordPress plugin. 2 minutes and 34 seconds. Last week I had 5,552 visitors to this site and that is the average amount of time a site visitor spent on this site before bouncing away. Even worse it that this is not actually a bad statistic, its about average for a blog of this type. Now I would love to think that the reason the average visit time is so short is because my blog readers are so interested in what I have to say that they are hungrily speed reading every word that I type in each post. But unfortunately I live in the real world, and in the real world thats simply not the most likely answer. The most likely answer is the cold hard fact that the internet is a very fast paced environment with lots of distractions and full of people with a very short attention span. The simple truth is that you only have a few precocious minutes at best (and often much less) to grab peoples attention. Even worse is the fact that people can sometimes be blind. They simply don’t see things that they are not expecting. This blog actually is a good example of that as well. At the end of each review of a product I endorse is a graphic that says “Approved: Click here to learn more”. Yet dozens of people have sent me messages asking me where my affiliate link is or asking me how they can buy the product I was promoting. It reminds me of a time I was at a gas station in winter. It was freezing cold outside and the stupid pump would not take my Visa card. After about 8-10 minutes of trying I went into the station to complain to the cashier, a person who promptly told me that their pumps are not working right and they could only take payments inside. As he ran my card I said to him “You know you should probably put a sign on the pumps so people are not outside freezing their assess of like idiots for no reason”. The clerk smiled and said something to the effect of “Thats a good idea” . His attitude and the way he chuckled at me kind of made me suspicious as I went outside to pump my gas, and since I was now looking for it, sure enough I found it. Right on the pump, right in front of my face the whole time, was a sign on the pump that said “Please see cashier to pay”. What am I an idiot? Nope, and neither where the people who did not notice my approved graphic. This is just the way human brains work. People focus on one thing (such as the text of an article, or in my case the credit card reader) and simply become ‘blind’ to other things. Unfortunately sometimes those other things are important. This is the problem Animatio aims to solve and it does so by playing on another quark of the human brain. Our eyes and our attention are drawn to movement. That fact is a throwback from our ancestors where it was of great use to quickly have our attention drawn to that thing moving in the corner of our eye (which might be a Lion getting ready to pounce). While people dont have to worry about getting eaten much anymore, our brains still have this survival adaptation and we as marketers can use it to subconsciously force peoples attention to important things that we want them to notice. One thing I was surprised to see is how easy Animatio is to use. I thought the interface would be all complex but its actually not. Its quite simple. First you install it on your WordPress site. Then you view any post or page while making sure your logged in as an admin. In the black admin navigation box that shows up top you will see a link for “Animatio” click it and the Animation box will open (see graphic at the beginning of this post). From here all you have to do is click on the element in your page that you want to add an animation from then select the animation from the control box and press save. Thats it. Super easy. In fact I was going to make a demo video but I decided not to because it would have been all of about 10 seconds long. Besides animations Animatio also lets you add sound effects to elements on your page. These can be regular effects or even entire spoken, pre-recorded, sentences that trigger when the site visitor hovers his mouse over that element (hold your mouse over the approved graphic near the end of this post for an example). While Animatio is super easy it is not 100% as I would have liked to see it. I noticed that when you add an animation or a sound to an element of your page, save it, click away and then come back later the software cant tell which animations or effects are already added. Its not that they dont save, the do, and the software works, its just that the drop down select boxes are not pre-set to the effect you already added. This also means you cant easily remove a effect from a single element, you have to reset the entire page. It might sound like Im picking on them with a trivial complaint but it annoyed me to see this. Perhaps it is just because I’m a developer. To be fair I kept thinking to myself “I would have found a way ..” . Still even though I found this little quark annoying it was not the end of the world and certainly not a ‘deal breaker’ for me. Also, in my testing, at least on this blog. Animatio does not seem to work on mobile devices. This may be because of my theme though (which frankly is quite outdated). Also it did not bother me to much since the majority of my traffic is not on a mobile device. What do I think of Animatio over all? Well I think its a practical solution to a very real problem. Just think about the people messaging me saying the could not find my affiliate link to buy the product after reading my review. There where several, but what I think about is how many people where there that did not message me. How many people just left my site thinking I was an idiot who forgot his link? How much money did I lose? Probably a lot more than the price of Animatio for sure. 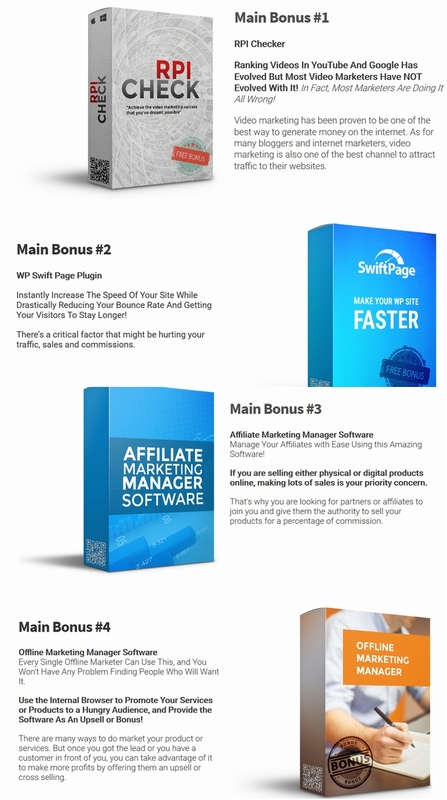 Also if your thinking that you dont need to worry about losing people because they dont notice things because your site is not getting a ton of traffic then your thinking all wrong. If your not getting a lot of traffic all that means is that you even more so cant afford to be loosing coversions because of something silly like people did not notice the important things on your site. Really when you think about it, it does not matter if your getting 1 site visitor a week or 1 million. The simple harsh truth is that not only are people easily distracted online, but people in general because of an psychological querk have ‘tunnel vision’ and will often miss things you really dont want them to miss. Animatio uses another psychilogical querk to solve this problem in a very elegant way. I like it! Brent – I’ve seen websites that cause portions, such as title (which it appears you used for the title of this blog) to “Jitter”. Also heard the voice with the “Approved” button (long time ago I figured that was where you had your link). BUT, the effect disappears after the first time the mouse hovers over the element. I have seen websites where the animation happens EVERY TIME you hover over an element. Is this by design? the quirk you mentioned? It’s enough for me to say “meh”. The effect can happen once or over and over. I have it set to happen once on this page, so yes its by design. The ‘quirk’ I’m talking about is mentioned in the review. Keep in mind when using something like this, there is a fine line between making something stand out and being annoying. This was a nicely written post Brett..